Justin Chisholm’s loyalty to the Yamaha tuning fork logo stretches all the way back to when he was a kid, bashing around the local minibike tracks on a bright yellow GT80. 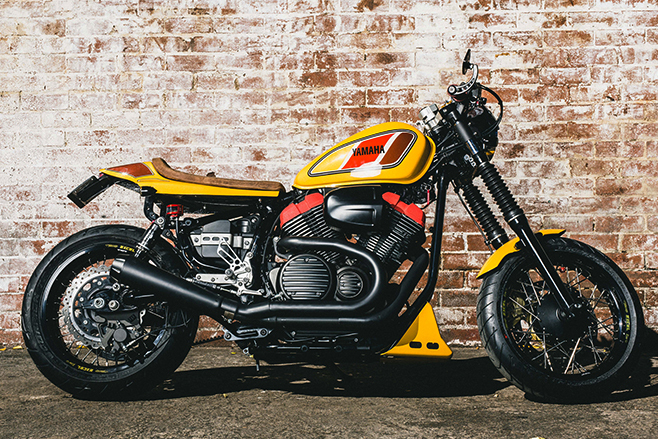 As an adult and a custom-bike builder, Chisholm has been given the opportunity to become reassociated with the Yamaha brand and channel his creative juices into the newly released Bolt C-Spec, a café racer version of Yamaha’s popular Bolt model. “I already had a soft spot for the regular Bolt, and the C-Spec has been done in such a cool way, I got one to customise when it was released,” Chisholm said. At the heart of the project is a bright yellow paint scheme based the GT80 he owned as a kid. The paint work was done by Lawrence and his team at Collide a Scope at Hornsby, NSW. “Lawrence tolerates my crazy projects and makes them reality including the GT95 logo. Like all of his creations, Chisholm has built the GT95 to be ridden, and had no hesitation in handing us over the keys for a test ride. The riding position is very much suited to taller riders, and the high rearsets make the most of the Bolt’s long wheelbase. From the rider’s seat it feels like an historic racebike – but the brakes are anything but – the single Brembo up front has the bite of a cut snake. Thanks to 17-inch rims and a 30mm height increase at the rear, the GT95 feels nothing like the Bolt. It turns in better than you expect it to; on the road it feels just like an old-school racer. The modifications have changed the steering angle dramatically so the damper will probably come in handy at high speeds. While there’s plenty to admire on the GT95, its seat and tail are a work of art. The tail is a generic flat-track unit, with hours of fabrication time invested to make it fit. The seat is trimmed in distressed leather with quilted stitching. It’s all work done by hand by CCU Motor Trimmers in NSW’s Moorebank. An enjoyable afternoon of playing with the Fox Float air shocks could easily be had. They have adjustable air chamber volume to adjust rising rate and you can also tune compression and rebound with air pressure. The GT95 isn’t about outright speed or power, it’s about the journey and arriving in style – the rumble from the exhaust system and bright yellow paint scheme makes sure you get noticed. You never forget your first true love and for Justin, that was his Yamaha GT80 minibike. In the mid-1970s knowing a kid with a minibike was cool and being that kid made you king of the school yard. Justin still has a photo of himself aboard his Yamaha GT80, and he based his vision for the GT95 build on the bike in that photo. The GT95 is a 21st century recreation of his first bike. The original Yamaha GT80 was a cool bike for little kids; Justin’s GT95 is a cool bike for big kids.